1 (reversible single end tram car) Ashbury R’lway Carrage & Iron Co. 20/18 1882 - 1898 1886 rebuilt as double ended car, 1889 top cover fitted by Rippon Bros.,1898 rebodied by Milnes(top covered) (double end tram car) George F. Milnes & Co. Birkenhead 62 (possibly) 1898 - ? 1 (HD8515) Tram bus on loan from Yorkshire Woollen District Leyland Titan. Huddersfield Civics Exibition. 1 VH5723 RANSOMES, SIMS & JEFFERIES 2161 Trolleybus Brush H60R 3 12 1933 - 11 9 1946 renumbered 401 ? 4 1942. sold to Harehills Motors after parts removed. 2 VH5724 KARRIER 54048 Trolleybus Park Royal H60R 3 12 1933 - 1 8 1947 renumbered 402 ? 4 1942. sold to Harehills Motors after parts removed. 2 VH6048 LEYLAND Cub KP2/1529 (one man bus) C.H. Roe B20F 1 3 1934 - 30 10 1939 sold to passenger transport, converted to breakdown wagon relicenced goods. 3 VH5725 KARRIER Trolleybus Park Royal H60R 3 12 1933 - 31 7 1947 renumbered 403 ? 4 1942. sold to Harehills Motors after parts removed. 3 VH6520 AEC Regal 6621614 Park Royal B32R 19 5 1934 - 30 10 1939 converted to minietime theatre for entertaining troups, Commandeered by military sold to Maltby Miners Coal & Transport Scheme Ltd.
4 (double end tram car) Starbuck Car & Wagon Co 18/16 28 4 1883 - 1892 1886 rebuilt by Rippon Bros. with parts from car 2, 1889 top cover fitted by Rippon Bros., 1892 rebodied by Milnes (top covered) (double end tram car) George F. Milnes & Co. Birkenhead 62 (possibly) 1892 - ? 4 VH5726 SUNBEAM P12005 Trolleybus Park Royal H60R 4 12 1933 - 31 5 1946 renumbered 404 ? 4 1942 sold to L Western after parts removed. 4 VH6521 AEC Regal 6621613 Park Royal B32 19 5 1934 - 30 10 1939 Commandeered by military 1 7 1940 returned 21 10 1941 in service to ? 1 1944 sold to Mason, Doncaster. 5 (double end tram car) Starbuck Car & Wagon Co 18/16 28 4 1883 - 1892 1886 rebuilt by Rippon Bros. with parts from car 2, 1889 top cover fitted by Rippon Bros., 1892 rebodied by Milnes (top covered) (double end tram car) George F. Milnes & Co. Birkenhead 62 (possibly) 1892 - ? 5 VH5727 KARRIER 54046 Trolleybus English Electric H60R 4 12 1933 - 1 8 1947 renumbered 405 ? 4 1942. sold to Harehills Motors after parts removed. 5 GVH795 GUY Arab UF71926 (one man bus) Park Royal-Guy B43F 4 3 1954 - ? 1968 sold to Green Bus, Rugeley. 6 (double end tram car) Starbuck Car & Wagon Co 18/16 28 4 1883 - 1898 1889 top cover fitted by Rippon Bros., 1892 rebodied by Milnes (top covered) (double end tram car) George F. Milnes & Co. Birkenhead 62 (possibly) 1898 - ? 6 VH6523 AEC Regal 6621616 Park Royal B32R 19 5 1934 - Commandeered by military 1 7 1940 returned 26 2 1941 in service to 27 1 1944 sold to Mason, Doncaster. 7 VH6524 AEC Regal 6621615 Park Royal B32R 1 6 1934 - Commandeered by military 1 7 1940 returned 14 10 1940 in service to 19 7 1944 sold to T.C. Moore Ltd., Saffron Holden, Essex. 8 VH6525 AEC Regal 6621617 Park Royal B32R 1 6 1934 - 30 10 1939 Commandeered by military 1 7 1940 returned 21 10 1941 in service to 19 7 1944 sold to T.C. Moore Ltd., Saffron Holden, Essex. 9 (double end tram car) Lancaster Wagon Co 50 1885 - ? 1887 top deck cover fitted by Rippon Bros.
9 VH6526 AEC_Regal_06621606 Brush B32R 1 6 1934 - ? 7 1944 sold to Arthur Rowe, Cudworth, Barnsley who had it rebodied by H.V.Burlingham C33F, sold to Thomsett Coaches. 9 VH6752 KARRIER 54086 Trolleybus Brush H64R 11 11 1934 - ? renumbered 409 ? 4 1942. sold to Reading Passenger Transport. 9 LVH9 AEC Reliance MU2RA1319 (one man bus) C.H.Roe B44F ? 1956 - ? Loaned to Baddeley Bros Holmfirth passed on to W.Y.P.T.E. 1 4 1974 as 4009 still on loan to Baddeley Bros.
10 (double end tram car) Starbuck Car & Wagon Co. 54 1885 - ? 1889 top deck cover fitted by Rippon Bros.
10 VH6527 AEC Regal 06621607 Brush B32R 1 6 1934 - 11 9 1944 sold to Henry Lane for Safety Coaches Ltd.
10 VH6753 KARRIER 54087 Trolleybus Brush H64R 5 11 1934 - ? renumbered 410 ? 4 1942. sold to Reading Passenger Transport. 10 MVH387 AEC Mandator 34741141 Eagle (tower wagon) ? 2 1958 - ? converted to Recovery Wagon ? 4 1964 renumbered A10 sold to Paul Sykes ? 11 (steam tram engine) Kitson & Co.,(Leeds) 232 Standard (improved) condenser:- Air (standard)1888 - ? 11 (double end tram car) Starbuck Car & Wagon Co. 54 1885 - ? 1889 top deck cover fitted by Rippon Bros.
11 VH6048 LEYLAND Cub KP2/1529 Lorry? 8 1941 - ? 1951 originally new 1 3 1934, ex J.O.C. bus 2 sold to passenger transport, converted to breakdown wagon relicenced goods. 11 VH6528 AEC Regal 06621608 Brush B32R 1 6 1934 - 11 9 1944 sold to Henry Lane for Safety Coaches Ltd.
11 ACX642 1937 AEC Regal 0662G2101 Grit Spreading Wagon, Motorbus routes ex bus 42 1949 - previously 13 lorry. 12 (steam tram engine) Kitson & Co., (Leeds) 233 Standard (improved) condenser:- Air (standard) 1988 - ? 12 (Double end tram car) George F. Milnes & Co. Birkenhead 62 (possibly) 1891 - ? 12 VH6529 AEC Regal 06621609 Brush B32R 1 6 1934 - ? ? 1945 sold to P.M. Morrell, Leeds. 12 VH6755 KARRIER 54090 Trolleybus Brush H64R 12 11 1934 - ? renumbered 412 ? 4 1942. sold to Reading Passenger Transport. 13 (steam tram engine) Kitson & Co., (Leeds) 236 Standard (improved) condenser:- Air (standard)1888 - ? 13 (Double end tram car) George F. Milnes & Co. Birkenhead 62 (possibly) 1891 - ? 14 (steam tram engine) Kitson & Co., (Leeds) 237 Standard (improved) condenser:- Air(standard) 1888 - ? 14 (Double end tram car) George F. Milnes & Co. Birkenhead 62 (possibly) 1887 - ? 1889 top deck cover fitted by Rippon Bros.
14 VH6757 KARRIER 54092 Trolleybus Brush H64R 12 11 1934 - ? renumbered 414 ? 4 1942. sold to Reading Passenger Transport. 15 (steam tram engine) Kitson & Co., (Leeds) 238 Standard (improved) condenser:- Air (standard) 1889 - ? 15 (Double end tram car) George F. Milnes & Co. Birkenhead 62 (possibly) 1887 - ? 1889 top deck cover fitted by Rippon Bros.
15 VH6758 KARRIER 54093 Trolleybus Brush H64R 11 11 1934 - ? renumbered 415 ? 4 1942. sold to Reading Passenger Transport. 16 (steam tram engine) Kitson & Co., (Leeds) 239 Standard (improved) condenser:- Air (standard) 1889 - ? 16 (Double end tram car) George F. Milnes & Co. Birkenhead 62 (possibly) 1888 - ? 16 WX568 LEYLAND Super Lion LT1 50240 ? 30 22 6 1934 - 17 3 1935 Taken over with the services of Wilson Haigh 22 6 1934, built 31 5 1929 sold to Milburn Garage. 16 VH6759 KARRIER 54094 Trolleybus Brush H64R 11 11 1934 - ? renumbered 416 ? 4 1942. sold to Reading Passenger Transport. 17 (steam tram engine) Kitson & Co., (Leeds) 244 Standard (improved) condenser:- Air (standard) 1890 - ? 17 (Double end tram car) George F. Milnes & Co. Birkenhead 62 (possibly) 1889 - ? 18 (steam tram engine) Kitson & Co., (Leeds) 245 Standard (improved) condenser:- Air (standard) 1890 - ? 18 (Double end tram car) George F. Milnes & Co. Birkenhead 62 (possibly) 1889 - ? 18 WX4676 LEYLAND Lion 50798 ? 30 22 6 1934 - 31 7 1937 Taken over with the services of Wilson Haigh 22 6 1934, built 20 6 1930 sold to W. North Leeds. 19 (steam tram engine) Thomas Green & Sons, (Leeds) 159 Standard (compound) condensers:- Air (Burrell or Blackburn) 1891 - ? 19 (Double end tram car) George F. Milnes & Co. Birkenhead 62 (possibly) 1890 - ? 19 WX4394 LEYLAND Tiger TS2 61141 ? 30 22 6 1934 - 31 7 1937 Taken over with the services of Wilson Haigh 22 6 1934, built 31 5 1930 sold to W. North Leeds. 19 VH6765 KARRIER 54097 Trolleybus Park Royal H64R 7 11 1934 - 25 7 1948 renumbered 419 ? 4 1942. sold to P.M. Morrell, Leeds. 20 (steam tram engine) Thomas Green & Sons, (Leeds) 160 Standard (compound) condensers:- Air (Burrell or Blackburn) 1891 - ? 20 (Double end tram car) George F. Milnes & Co. Birkenhead 62 (possibly) 1890 - ? 20 VH6767 KARRIER 54098 Trolleybus Park Royal H64R 11 11 1934 - 28 7 1948 renumbered 420 ? 4 1942. sold to P.M. Morrell, Leeds. 21 (steam tram engine) Kitson & Co., (Leeds) 247 Standard (compound) condensers:- Air (Ogee) 1891 - ? 21 (Double end tram car) George F. Milnes & Co. Birkenhead 62 (possibly) 1890 - ? 21 VH6766 KARRIER 54099 Trolleybus Park Royal H64R 11 11 1934 - 28 7 1948 renumbered 421 ? 4 1942. sold to P.M. Morrell, Leeds. 22 (steam tram engine) Kitson & Co., (Leeds) 248 Standard (compound) condensers:- Air (Ogee) 1891 - ? 22 (Double end tram car) George F. Milnes & Co. Birkenhead 62 (possibly) 1892 - ? 22 YG852 LEYLAND LT5 1605 ? 32 22 6 1934 - 30 4 1939 Taken over with the services of Wilson Haigh 22 6 1934, built 31 5 1932, sold to Lancashire Motor Traders Ltd.
22 VH6768 KARRIER 54100 Trolleybus Park Royal H64R 11 11 1934 - 28 7 1948 renumbered 422 ? 4 1942. sold to P.M. Morrell, Leeds. 23 (steam tram engine) Thomas Green & Sons, (Leeds) 181 Standard (compound) condensers:- Air (Burrell or Blackburn) 1892 - ? 23 (Double end tram car) George F. Milnes & Co. Birkenhead 62 (possibly)1894 - ? 23 VH3527 AEC Regal 662477 ? 32 22 6 1934 - 1 10 1938 Taken over with the services of Wilson Haigh 22 6 1934, built 31 7 1931 sold to W. North Leeds. 24 (steam tram engine) Thomas Green & Sons, (Leeds) 182 Standard (compound) condensers:- Air (Burrell or Blackburn) 1892 - ? 24 (Double end tram car) George F. Milnes & Co. Birkenhead 62 (possibly) 1894 - ? 24 VH6772 KARRIER 54107 Trolleybus Park Royal H64R 12 11 1934 - ? 8 1948 renumbered 424 ? 4 1942. sold to L.B. Kell, Close Hill, Newsome. 25 (steam tram engine) Thomas Green & Sons, (Leeds) 183 Standard (compound) condensers:- Air (Burrell or Blackburn) 1892 - ? 25 (Double end tram car) George F. Milnes & Co. Birkenhead 94 1896 - ? 25 VO6841 AEC Regal 6621076 ? 32 22 6 1934 - 24 10 1939 Taken over with the services of Wilson Haigh 22 6 1934, built 31 10 1931 sold to W. North Leeds. 25 VH6769 KARRIER 54101 Trolleybus Park Royal H64R 11 11 1934 - 28 7 1948 renumbered 425 ? 4 1942. sold to P.M. Morrell, Leeds. 26 (steam tram engine) Thomas Green & Sons, (Leeds) 184 Standard (compound) condensers:- Air (Burrell or Blackburn) 1892 - ? 26 (Double end tram car) George F. Milnes & Co. Birkenhead 94 1896 - ? 26 VH6762 KARRIER 54104 Trolleybus Park Royal H64R 12 11 1934 - 31 12 1948 renumbered 426 ? 4 1942. sold to P.M. Morrell, Leeds. 27 (steam tram engine) Thomas Green & Sons, (Leeds) 185 Standard (compound) condensers:- Air (Burrell or Blackburn) 1892 - ? 27 VH6770 KARRIER 54102 Trolleybus Park Royal H64R 12 11 1934 - 31 12 1948 renumbered 427 ? 4 1942. sold to P.M. Morrell, Leeds. 28 (steam tram engine) Thomas Green & Sons, (Leeds) 186 Standard (compound) condensers:- Air (Burrell or Blackburn) 1892 - ? 28 WW8274 LEYLAND Tiger TS2 60025 ? 30 22 6 1934 - 17 3 1935 Taken over with the services of Wilson Haigh 22 6 1934, built 14 12 1928 sold to Milburn Garage. 28 VH6773 KARRIER 54108 Trolleybus Park Royal H64R 11 11 1934 - 31 12 1948 renumbered 428 ? 4 1942. body destroyed by fire 6 1 1940, rebodied Park Royal H64R 1 5 1941, sold to P.M. Morrell, Leeds. 28 MVH28F AEC Swift (one man bus) C.H.Roe B44F ? 1968 - ? passed to W.Y.P.T.E. 1 4 1974 as 4028, Sold to the Government of Malta, used during a bus owners strike, would have been sold to a operator But was found to have a defective chassis, the body passed to Zinnu Coachworks & the chassis became support for a hedge. 29 (steam tram engine) Thomas Green & Sons, (Leeds) 187 Standard (compound) condensers:- Air (Burrell or Blackburn) 1892 - ? 29 VH6769 KARRIER 54105 Trolleybus Park Royal H64R 12 11 1934 - 31 12 1948 renumbered 429 ? 4 1942. sold to P.M. Morrell, Leeds. 30 (steam tram engine) Thomas Green & Sons, (Leeds) 188 Standard (compound) condensers:- Air (Burrell or Blackburn) 1894 - ? 30 VH6764 KARRIER 54103 Trolleybus Park Royal H64R 11 11 1934 - 31 12 1948 renumbered 430 ? 4 1942. sold to P.M. Morrell, Leeds. 31 (steam tram engine) Kitson & Co., (Leeds) 274 Standard (improved) condensers:- Air (Pogson) 1894 - ? 31 VH8722 KARRIER 54124 Trolleybus Weymann H64R 5 3 1936 - ? 2 1948 renumbered 431 ? 4 1942. sold to P.M. Morrell, Leeds. 32 (steam tram engine) Kitson & Co., (Leeds) 275 Standard (improved) condensers:- Air (Pogson) 1894 - ? 32 VH8530 KARRIER 54123 Trolleybus Park Royal H64R 21 12 1935 - 31 1 1949 renumbered 432 ? 4 1942. sold to P.M. Morrell, Leeds. 33 VH9933 KARRIER 31003 Trolleybus Park Royal H34/30R 2 5 1937 - 31 1 1949 renumbered 433 ? 4 1942. sold to P.M. Morrell, Leeds. 34 CX8154 KARRIER KL 5624 Northern Counties B32F 13 5 1926 - 31 8 1932 sold to F. Lee. 34 VH9934 KARRIER 31004 Trolleybus Park Royal H34/30R 3 5 1937 - 31 1 1949 renumbered 434 ? 4 1942. sold to P.M. Morrell, Leeds. 35 VH7892 AEC Regal 06621742 Park Royal B32R 20 7 1935 - 29 11 1949 sold to P.M. Morrell, Leeds. 35 VH9935 KARRIER 31005 Trolleybus Park Royal H34/30R 2 5 1937 - 31 1 1949 renumbered 435 ? 4 1942. sold to P.M. Morrell, Leeds. 36 VH7893 AEC Regal 06621743 Park Royal B32R 20 7 1935 - 29 11 1949 sold to P.M. Morrell, Leeds. 36 VH9936 KARRIER 31006 Trolleybus Park Royal H34/30R 2 5 1937 - 31 1 1949 renumbered 436 ? 4 1942. sold to P.M. Morrell, Leeds. 37 (electric tram) B.E.C. SB60 truck B.E.C. ? ? 1902 - ? 6 1934 later fitted with top cover, given to St. Mary's Hospital, Deanhouse, Holmfirth as a shelter. 37 CX8157 KARRIER KL 5627 Northern Counties 30 5 6 1926 - 31 8 1932 sold to W. Bassett. 37 VH7894 AEC Regal 06621744 Park Royal B32R 20 7 1935 - 29 11 1949 sold to P.M. Morrell, Leeds. 37 VH9937 KARRIER 31007 Trolleybus Park Royal H34/30R 2 5 1937 - 28 2 1949 renumbered 437 ? 4 1942. sold to P.M. Morrell, Leeds. 39 (electric tram) B.E.C. SB60 truck B.E.C. ? ? 1902 - ? 12 1934 later fitted with top cover, sold to Grahamsley's Newcastle upon Tyne. 39 CX8905 KARRIER KL 5696 Northern Counties 30 1 11 1926 - 30 9 1932 sold Transport Dep’t. 39 VH9939 KARRIER 31009 Trolleybus Park Royal H34/30R 2 5 1937 - 28 1 1949 renumbered 439 ? 4 1942. sold to P.M. Morrell, Leeds. 40 CX8906 KARRIER KL 5695 Northern Counties 30 1 11 1926 - 30 9 1932 sold Transport Dep’t. 40 VH9940 KARRIER 31010 Trolleybus Park Royal H43/30R 2 5 1937 - 31 1 1949 renumbered 440 ? 4 1942. sold to P.M. Morrell, Leeds. 41 AVH441 KARRIER 31019 Trolleybus Park Royal H34/30R 3 10 1937 - 31 1 1949 renumbered 441 ? 4 1942. sold to P.M. Morrell, Leeds. 42 CX8908 KARRIER KL 5697 Northern Counties 30 17 11 1926 - 30 9 1932 sold Transport Dep’t. 42 AVH442 KARRIER 31020 Trolleybus Park Royal H34/30R 1 10 1937 - 28 2 1949 renumbered 442 ? 4 1942. sold to P.M. Morrell, Leeds. 43 CX8909 KARRIER KL 5698 Northern Counties 30 17 11 1926 - 31 10 1932 sold to J. Corrigan Dewsbury. 43 ACX643 AEC Regal 0662G2102 Brush B32R 1 5 1937 - 29 11 1949 sold to P.M. Morrell, Leeds. 43 AVH443 KARRIER 31021 Trolleybus Park Royal H34/30R 1 10 1937 - 28 2 1949 renumbered 443 ? 4 1942. sold to P.M. Morrell, Leeds. 44 CX8910 KARRIER KL 5699 Northern Counties 30 1 1 1927 - 31 10 1932 sold to P. Vanner. 44 AVH444 KARRIER 31022 Trolleybus Park Royal H34/30R 6 10 1937 - 23 1 1952 renumbered 444 ? 4 1942. sold to P.M. Morrell, Leeds. 45 ACX645 AEC Regal 0662G2104 Brush B32R 1 5 1937 - ? 2 1950 sold to P.M. Morrell, Leeds. 45 AVH445 KARRIER 31023 Trolleybus Park Royal H34/30R 4 10 1937 - 28 2 1949 renumbered 445 ? 4 1942. sold to P.M. Morrell, Leeds. 46 AVH446 KARRIER 31024 Trolleybus Park Royal H34/30R 4 10 1937 - ? 7 1952 renumbered 446 ? 4 1942. sold to R. Jannett, Leeds. 46 BCX446 AEC Regal 0662G2868 Park Royal B32R 1 8 1938 - 30 9 1950 (seating reduced to 26, 1 7 1942-27 10 1945) sold to P.M. Morrell, Leeds. 47 AVH447 KARRIER 31025 Trolleybus Park Royal H34/30R 2 10 1937 - ? 4 1951 renumbered 447 ? 4 1942. body shell sold to P.M. Morrell, Leeds. 47 BCX447 AEC Regal 0662G2866 Park Royal B32R 1 8 1938 - 5 10 1950 (seating reduced to 26, 1 7 1942-20 10 1945) sold to Maltby Miners Coal & Transport Scheme Ltd.
48 AVH448 KARRIER 31026 Trolleybus Park Royal H34/30R 3 10 1937 - 24 4 1951 renumbered 448 ? 4 1942. sold to P.M. Morrell, Leeds. 48 BCX448 AEC Regal 0662G2867 Park Royal B32R 1 8 1938 - 30 9 1950 (seating reduced to 26, 1 7 1942- 6 10 1945) sold to P.M. Morrell, Leeds. 49 AVH449 KARRIER 31027 Trolleybus Park Royal H34/30R 3 10 1937 - ? 7 1952 renumbered 449 ? 4 1942. sold to R. Jannett, Leeds. 50 AVH450 KARRIER 31028 Trolleybus Park Royal H34/30R 5 10 1937 - 24 4 1951 renumbered 450 ? 4 1942. sold to P.M. Morrell, Leeds. 51 AVH451 KARRIER 31029 Trolleybus Park Royal H24/30R 5 10 1937 - 13 3 1951 renumbered 451 ? 4 1942. sold to P.M. Morrell, Leeds. 51 BCX451 AEC Regal 0662G2917 Park Royal B32R 1 8 1938 - 20 3 1954 (seating reduced to 26, ? 11 1941 - 13 10 1945) sold to AMCC Livingstone Rd, Strattford. 52 AVH452 KARRIER 31030 Trolleybus Park Royal H34/30R 4 10 1937 - 27 11 1953 renumbered 452 ? 4 1942. sold to Epsom & Ewell Council. 52 BCX452 AEC Regal 0662G2918 Park Royal B32R 1 8 1938 - 20 3 1954 (seating reduced to 26, 1 7 1942 - 6 10 1945) sold to AMCC Livingstone Rd, Strattford. 53 AVH453 KARRIER 31031 Trolleybus Park Royal H34/30R 9 11 1937 - 24 4 1951 renumbered 453 ? 4 1942. sold to P.M. Morrell, Leeds. 53 BCX453 AEC Regal 0662G2919 Park Royal B32R 1 8 1938 - 30 9 1950 (seating reduced to 26, 1 7 1942 - 6 10 1945) sold to P.M. Morrell, Leeds. 54 AVH454 KARRIER 31032 Trolleybus Park Royal H34/30R 8 11 1937 - 10 8 1951 renumbered 454 ? 4 1942. sold to P.M. Morrell, Leeds. 55 AVH455 KARRIER 31033 Trolleybus Park Royal H34/30R 8 11 1937 - 2 10 1951 renumbered 455 ? 4 1942. sold to P.M. Morrell, Leeds. 56 AVH456 KARRIER 31034 Trolleybus Park Royal H34/30R 8 11 1937 - 26 7 1951 renumbered 456 ? 4 1942. sold to P.M. Morrell, Leeds. 56 BCX456 AEC Regal 0662G2922 Park Royal B32R 1 9 1938 - 11 1 1954 (seating reduced to 26, 1 7 1942 - ? ? 1945) sold to Tiger Coaches, Salsburgh, Motherwell. 57 AVH457 KARRIER 31035 Trolleybus Park Royal H34/30R 8 11 1937 - ? 7 1952 renumbered 457 ? 4 1942. sold to R. Jannett, Leeds. 57 BVH157 AEC Regal 0662G3080 Park Royal B32R 1 5 1939 - 20 3 1954 (seating reduced to 26, ? 11 1941 - ? 2 1945) sold to AMCC Livingstone Rd, Strattford. 58 AVH456 KARRIER 31034 Trolleybus Park Royal H34/30R 8 11 1937 - 30 4 1950 renumbered 458 ? 4 1942. sold to P.M. Morrell, Leeds. 58 NCX367 a 1960 AEC-HANSON Regal 6673 (one man bus) C.H.Roe FB39F 1 10 1969 - ? 7 1970 taken over with the services of Hansons Buses (358) 1 10 1969 Originally rebuilt in ? 6 1960 from Hansons bus 282 ECX741 9621E653 a AEC Regal lll, with Duple B35F built ? ? 1949. sold to Askin, Barnsley (scrap). 59 AVH459 KARRIER 31037 Trolleybus Park Royal H34/30R 9 11 1937 - 28 11 1953 renumbered 459 ? 4 1942. sold to Epsom & Ewell Council. 59 BVH159 AEC Regal 0662G3089 Park Royal B32R 8 5 1939 - 30 10 1950 (seating reduced to 26, ? - 3 2 1945) sold to P.M. Morrell, Leeds. 59 NCX481 a 1960 AEC-HANSON Regal 6674 (one man bus) C.H.Roe FB39F 1 10 1969 - ? 7 1970 taken over with the services of Hansons Buses (359) 1 10 1969 Originally rebuilt in ? 6 1960 from Hansons bus 288 EVH82 9621E875 a AEC Regent lll, with Duple B35F built ? ? 1949 sold to Askin, Barnsley (scrap). 60 VH1097 KARRIER WL6 42059 Northern Counties B38R 16 12 1927 - 31 7 1933 sold to Park Royal Coachworks. 60 AVH460 KARRIER 31038 Trolleybus Park Royal H34/30R 19 11 1937 - 3 10 1953 renumbered 460 ? 4 1942. sold to Mr. Blair Blackley Manchester. 60 BVH160 AEC Regal 0662G3090 Park Royal B32R 1 5 1939 - 30 10 1950 (seating reduced to 26, ? - 27 1 1945) sold to P.M. Morrell, Leeds. 60 SCX543 a 1960 AEC-HANSON Regal 6675 (one man bus) C.H.Roe FB39F 1 10 1969 - ? 7 1970 taken over with the services of Hansons Buses (360) 1 10 1969 originally rebuilt in ? 6 1960 from Hansons bus 291 EVH85 9621E879 a AEC Regent lll, with Duple B35F built ? ? 1949 sold to Askin, Barnsley (scrap). 61 AVH461 KARRIER 31039 Trolleybus Park Royal H34/30R 10 4 1938 - ? renumbered 461 ? 4 1942. sold to P.M. Morrell, Leeds. 62 AVH462 KARRIER 31040 Trolleybus Park Royal H34/30R 4 1 1938 - 21 7 1954 renumbered 462 ? 4 1942. sold to F Kilburn Huddersfield. 62 BVH162 AEC Regal 0662G3092 Park Royal B32R 6 5 1939 - 30 10 1950 (seating reduced to 26, ? 11 1941 - 27 1 1945) sold to P.M. Morrell, Leeds. 63 AVH463 KARRIER 31041 Trolleybus Park Royal H34/30R 20 4 1938 - ? 7 1952 renumbered 463 ? 4 1942. sold to R Jannett, Leeds. 63 BVH163 AEC Regal 0662G3093 Park Royal B32R 1 5 1939 - 20 3 1954 (seating reduced to 26, 1 7 1942 - 20 1 1945) sold to AMCC Livingstone Rd, Strattford. 64 AVH464 KARRIER 31072 Trolleybus Park Royal H34/30R 19 6 1938 - 5 3 1954 renumbered 464 ? 4 1942. sold to F Kilburn Huddersfield. 64 BVH164 AEC Regal 0662G3094 Park Royal B32R 11 5 1939 - 30 10 1950 (seating reduced to 26, ? 11 1941 - 20 1 1945) sold to P.M. Morrell, Leeds. 65 AVH465 KARRIER 31043 Trolleybus Park Royal H34/30R 11 1 1938 - 19 6 1950 renumbered 465 ? 4 1942. body shell sold to P.M. Morrell, Leeds. 66 AVH466 KARRIER 31044 Trolleybus Park Royal H34/30R 10 4 1938 - ? 7 1952 renumbered 466 ? 4 1942. sold to R Jannett, Leeds. 67 BVH167 AEC Regal 0662G3081 Weymann B32R 1 4 1939 - 30 9 1950 (seating reduced to 26, 1 1 1943 - 20 1 1945) sold to P.M. Morrell, Leeds. 68 AVH468 KARRIER 31046 Trolleybus Park Royal H34/30R 11 4 1938 - ? 7 1952 renumbered 468 ? 4 1942. sold to R Jannett, Leeds. 68 BVH168 AEC Regal 0662G3082 Weymann B32R 1 4 1939 - 5 10 1950 (seating reduced to 26, 1 1 1943 - 13 1 1945) sold to Maltby Miners Coal & Transport Scheme Ltd.
69 VH1472 KARRIER KL 5728 Northern Counties 30 3 8 1928 - 1 6 1934 sold to J. White Jnr., Buxton Fairground. 69 AVH469 KARRIER 31047 Trolleybus Park Royal H34/30R 10 4 1938 - ? 7 1952 renumbered 469 ? 4 1942. sold to R Jannett, Leeds. 69 BVH169 AEC Regal 0662G3083 Weymann B32R 1 4 1939 - 20 10 1950 (seating reduced to 26, 1 1 1943 - 6 1 1945) sold to Maltby Miners Coal & Transport Scheme Ltd.
70 BVH170 AEC Regal 0662G3084 Park Royal B32R 1 5 1939 - 5 7 1950 sold to Maltby Miners Coal & Transport Scheme Ltd.
71 AVH471 KARRIER 31049 Trolleybus Park Royal H34/30R 10 4 1938 - 30 10 1953 renumbered 471 ? 4 1942. sold to Epsom & Ewell Council. 71 BVH171 AEC Regal 0662G3085 Weymann B32R 1 5 1939 - 30 10 1950 sold to P.M. Morrell, Leeds. 72 AVH472 KARRIER 31073 Trolleybus Park Royal H34/30R 20 6 1938 - ? 7 1952 renumbered 472 ? 4 1942. sold to R Jannett, Leeds. 72 BVH172 AEC Regal 0662G3086 Weymann B32R 1 5 1939 - 13 4 1950 sold to Maltby Miners Coal & Transport Scheme Ltd.
73 AVH473 KARRIER 31074 Trolleybus Park Royal H34/30R 20 6 1938 - 12 10 1953 renumbered 473 ? 4 1942. sold to Mr. Blair Blackley Manchester. 73 BVH173 AEC Regal 0662G3087 Weymann B32R 1 5 1939 - 20 9 1950 sold to Maltby Miners Coal & Transport Scheme Ltd.
74 AVH474 KARRIER 31052 Trolleybus Park Royal H34/30R 11 4 1938 - 12 10 1953 renumbered 474 ? 4 1942. sold to Mr. Blair Blackley Manchester. 79 VH3293 AEC Regal 662633 ? 32 3 1 1931 - 31 12 1938 sold to W. North, Leeds. 80 VH3294 AEC Regal 662631 ? 32 3 1 1931 - 31 12 1938 sold to W. North, Leeds. 80 AVH480 KARRIER 31077 Trolleybus Park Royal H34/30R 19 6 1938 - 1 4 1950 renumbered 480 ? 4 1942. sold to P.M. Morrell, Leeds. 81 VH3295 AEC Regal 662634 ? 32 3 1 1931 - 31 12 1938 sold to W. North, Leeds. 82 (electric tram) Brill 21E truck U.E.C. ? ? 1912 - ? 7 1938 sold to W. H. Robinson Milnsbridge, Huddersfield. 82 VH3296 AEC Regal 662632 ? 32 3 1 1931 - 31 12 1938 sold to W. North, Leeds. 82 AVH482 KARRIER 31060 Trolleybus Park Royal H34/30R 11 4 1938 - 23 3 1956 renumbered 482 ? 4 1942. 83 VH3811 AEC Regal 6621081 Cravens 32 14 7 1931 - 24 3 1939 sold to Lancashire Motor Traders Ltd.
84 VH3812 AEC Regal 6621079 Cravens 32 14 7 1931 - 30 4 1939 sold to Lancashire Motor Traders Ltd.
84 DVH124 DAIMLER CVG6 14212 Willowbrook B34R 26 3 1948 - ? 1961, later with a fairground. 85 VH3843 AEC Regal 6621082 Cravens 32 2 9 1931 - 30 4 1939 sold to Lancashire Motor Traders Ltd.
86 VH3844 AEC Regal 6621086 Cravens 32 2 9 1931 - 30 4 1939 sold to Lancashire Motor Traders Ltd.
86 AVH486 KARRIER 31080 Trolleybus Park Royal H34/30R 20 6 1938 - 29 7 1955 renumbered 486 ? 4 1942. sold to Aluminimum & Allied Products. 87 VH3845 AEC Regal 6621087 Cravens 32 2 9 1931 - 28 2 1939 sold to Lancashire Motor Traders Ltd.
88 VH3813 AEC Regal 6621078 Northern Counties 32 14 7 1931 - 30 4 1939 sold to Lancashire Motor Traders Ltd.
88 AVH488 KARRIER 31066 Trolleybus Park Royal H34/30R 10 4 1938 - 30 10 1953 renumbered 488 ? 4 1942. sold to Epsom & Ewell Council. 89 VH3814 AEC Regal 6621080 Northern Counties 32 14 7 1931 - 30 4 1939 sold to Lancashire Motor Traders Ltd.
89 AVH489 KARRIER 31067 Trolleybus Park Royal H34/30R 10 4 1938 - 30 10 1953 renumbered 489 ? 4 1942. sold to Epsom & Ewell Council. 90 VH3846 AEC Regal 6621083 Northern Counties 32 15 8 1931 - 30 4 1939 sold to Lancashire Motor Traders Ltd.
91 VH3847 AEC Regal 6621084 Northern Counties 32 15 8 1931 - 30 4 1939 sold to Lancashire Motor Traders Ltd.
92 VH3848 AEC Regal 6621085 Northern Counties 32 22 8 1931 - 30 4 1939 sold to Lancashire Motor Traders Ltd.
94 EVH904 DAIMLER CVG6 14938 Willowbrook B34R 6 9 1950 - ? 1964, 1950 commercial motor show exibit and fitted with a chrome radiator. 97 VH4616 AEC Regal 6621369 Northern Counties 32 1 8 1932 - ? 12 1943 sold to Maltby Miners Coal & Transport Scheme Ltd.
98 VH4617 AEC Regal 6621370 Northern Counties 32 1 8 1932 - 30 4 1939 sold to Bottomleys Motors Ltd., Huddersfield. 98 EVH908 DAIMLER CVG6 16640 Willowbrook B34R 1 9 1950 - ? 1961 sold to Passenger Transport Dept. 99 VH4681 AEC Regal 6621371 Northern Counties 32 1 9 1932 - 31 7 1938 sold to W. North, Leeds. 100 VH2963 AEC Regent 661539 ? H26/24R 19 4 1930 - 31 12 1938 sold to W. North, Leeds. 101 VH2964 AEC Regent 661540 ? H26/24R 19 4 1930 - 31 7 1938 sold to W. North, Leeds. 102 VH2965 AEC Regent 661541 ? H26/24R 21 4 1930 - 31 7 1938 sold to W. North, Leeds. 102 XCX102 LEYLAND Titan PD2 C.H.Roe H37/28F ? 1963 - ? passed to W.Y.P.T.E. 1 4 1974 as 4102 sold to Shaws, Bradford. 103 VH2966 AEC Regent 661542 ? H26/24R 3 5 1930 - 30 6 1938 sold to W. North, Leeds. 106 AVH506 KARRIER 31042 Trolleybus Brush H34/30R 2 1 1939 - 28 2 1949 renumbered 506 ? 4 1942. sold to P.M. Morrell, Leeds. 107 AVH507 KARRIER 31063 Trolleybus Brush H34/30R 12 5 1938 - 31 1 1949 renumbered 507 ? 4 1942. sold to P.M. Morrell, Leeds. 108 VH4753 AEC Regent 6611909 Northern Counties H26/24R 3 11 1932 - 30 6 1939 sold to W. North, Leeds. 109 VH4754 AEC Regent 6611930 Northern Counties H26/24R 2 11 1932 - 30 6 1939 sold to W. North, Leeds. 110 VH4755 AEC Regent 6611931 Northern Counties H26/24R 1 11 1932 - 30 6 1938 sold to W. North, Leeds. 110 AVH510 KARRIER 31062 Trolleybus Brush H34/30R 3 5 1938 - 23 4 1951 renumbered 510 ? 4 1942. sold to P.M.Morrell, Leeds. 111 VH4756 AEC Regent 6611926 Northern Counties H26/24R 1 11 1932 - 30 6 1938 sold to W. North, Leeds. 111 AVH511 KARRIER 31065 Trolleybus Brush H34/30R 7 5 1938 - 31 1 1949 renumbered 511 ? 4 1942. sold to P.M. Morrell, Leeds. 112 AVH512 KARRIER 31064 Trolleybus Brush H34/30R 15 4 1938 - 28 2 1949 renumbered 512 ? 4 1942. sold to P.M.Morrell, Leeds. 113 VH4758 AEC Regent 6611928 Northern Counties H26/24R 1 11 1932 - 30 6 1938 sold to W. North, Leeds. 113 AVH513 KARRIER 31053 Trolleybus Brush H34/30R 30 4 1938 - 28 2 1949 renumbered 513 ? 4 1942. sold to P.M.Morrell, Leeds. 114 AVH514 KARRIER 31058 Trolleybus Brush H34/30R 26 4 1938 - 28 2 1949 renumbered 514 ? 4 1942. sold to P.M.Morrell, Leeds. 115 VH5730 AEC Regent 6612250 Brush H30/26R 1 11 1933 - 9 7 1947 sold to Lancashire Motor Traders Ltd.
115 AVH515 KARRIER 31050 Trolleybus Brush H34/30R 2 1 1939 - 19 4 1947 renumbered 515 ? 4 1942. 116 AVH516 KARRIER 31094 Trolleybus Weymann H34/30R 1 1 1940 - 25 7 1955 renumbered 516 ? 4 1942. sold to Aluminimum & Allied Products. 118 VH5733 AEC Regent 6612253 Brush H30/26R 3 11 1933 - 1 4 1946 loaned to Sheffield 16 12 1940 - 4 1 1941, sold to Chapmans Ivy Coaches Ltd., Huddersfield. 120 VH6217 AEC Regent 6612689 body from Karrier bus 105 rebuilt by Park Royal H26/24R 17 3 1934 - 10 1 1945 sold to Bournemouth Corporation later rebuilt as tower wagon now preserved. 120 AVH520 KARRIER 31098 Trolleybus Weymann H34/30R 1 1 1940 - 25 7 1955 renumbered 520 ? 4 1942. sold to Aluminimum & Allied Products. 121 AVH521 KARRIER 31099 Trolleybus Weymann H34/30R 1 1 1940 - 28 6 1955 renumbered 521 ? 4 1942. sold to Aluminium & Allied Products. 122 AVH522 KARRIER 31100 Trolleybus Weymann H34/30R 1 1 1940 - 20 6 1955 renumbered 522 ? 4 1942. sold to Aluminium & Allied Products. 123 VH6347 AEC Regent 6612689 Brush H30/26R 7 4 1934 - 30 9 1950 sold to P.M.Marrell Ltd., Leeds. 124 VH6348 AEC Regent 6612688 Brush H30/26R 7 4 1934 - 29 11 1949 sold to P.M. Marrell Ltd., Leeds. 126 VH8027 AEC Regent 06613642 Brush H30/26R 2 8 1935 - 23 7 1947 sold to Lancashire Motor Traders Ltd.
127 VH9200 AEC Regent 06613619 Brush H30/26R 30 5 1936 - 30 6 1947 sold to Lancashire Motor Traders Ltd.
128 VH9201 AEC Regent 06613750 Brush H30/26R 30 5 1936 - 14 5 1947 sold to Lancashire Motor Traders Ltd.
129 VH9202 AEC Regent 06613751 Brush H30/26R 30 5 1936 - 22 10 1949 sold to K.Broadbent, Marsh, Huddersfield. 130 AVH430 AEC Regent 0661G5316 Brush H28/26R 3 12 1937 - 5 2 1948 sold to W.Denton. 130 UCX130H DAIMLER Fleetline (one man bus) C.H.Roe H45/29D 1 6 1970 - ? passed to W.Y.P.T.E. 1 4 1974 as 4130 Became a Barnardo's Playbus in Ireland. 131 AVH431 AEC Regent 0661G5317 Brush H28/26R 3 12 1937 - 15 7 1947 sold to Altringham Coachways Ltd.
132 AVH432 AEC Regent 0661G5318 Brush H28/26R 3 12 1937 - ? sold to Henry Lane. 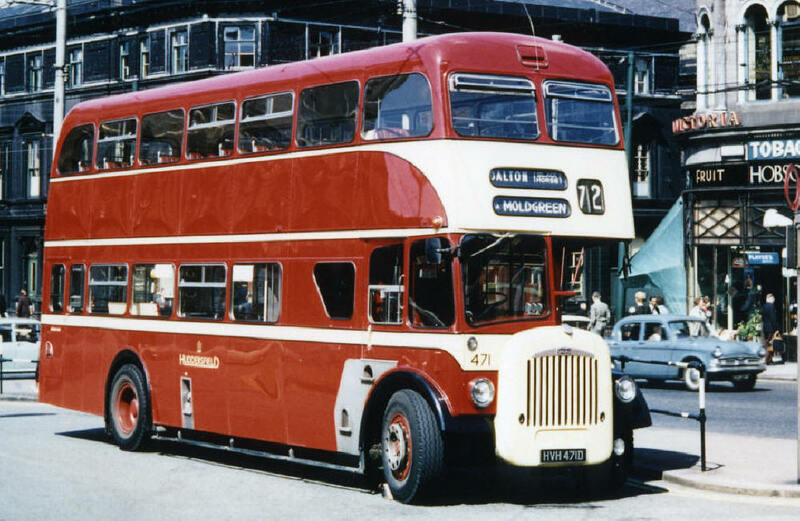 Sold to Taylor, Reliance, Meppershall 1948 and rebodied Whitson C35F ?, sold to Morton, Astoria, London SE10 1955, to Price, Ramsey, Isle of Man 1958 and re-registered XMN628, sold to Hamill, Douglas IOM 1959 to 1961. 133 AVH433 AEC Regent 0661G5319 Brush H28/26R 3 12 1937 - 30 9 1950 sold to P.M. Marrell Ltd., Leeds. 134 AVH434 AEC Regent 0661G5320 Brush H28/26R 1 1 1938 - ? 11 1951 sold to P.M. Marrell Ltd., Leeds. 135 AVH435 AEC Regent 0661G5321 Brush H28/26R 1 1 1938 - 30 9 1950 sold to P.M.Marrell Ltd., Leeds. 136 BCX236 AEC Regent 0661G6008 Park Royal H28/26R 17 6 1938 - 30 9 1950 sold to P.M. Marrell Ltd., Leeds. 137 BCX237 AEC Regent 0661G6009 Park Royal H28/26R 1 7 1938 - 30 9 1950 sold to P.M. Marrell Ltd., Leeds. 138 BCX238 AEC Regent 0661G6010 Park Royal H28/26R 1 8 1938 - 30 9 1950 sold to P.M. Marrell Ltd., Leeds. 138 BVH538 KARRIER 31140 Trolleybus Park Royal H34/30R 1 6 1939 - 27 7 1955 renumbered 538 ? 4 1942. sold to Aluminimum & Allied Products. 139 BCX239 AEC Regent 0661G6011 Park Royal H28/26R 1 7 1938 - 30 9 1950 sold to P.M. Marrell Ltd., Leeds. 140 BCX240 AEC Regent 0661G6012 Park Royal H28/26R 1 8 1938 - 30 9 1950 sold to P.M. Marrell Ltd., Leeds. 141 BCX241 AEC Regent 0661G6013 Park Royal H28/26R 1 8 1938 - ? 11 1951 sold to P.M. Marrell Ltd., Leeds. 142 BVH242 AEC Regent 0661G6022 Park Royal H28/26R 4 3 1939 - ? 11 1951 sold to P.M. Marrell Ltd., Leeds. 143 BVH243 AEC Regent 0661G6023 Park Royal H28/26R 4 3 1939 - ? 11 1951 sold to P.M. Marrell Ltd., Leeds. 144 BVH244 AEC Regent 0661G6024 Park Royal H28/26R 3 3 1939 - 30 9 1950 sold to P.M. Marrell Ltd., Leeds. 145 BVH245 AEC Regent 0661G6025 Park Royal H28/26R 3 3 1939 - ? 1950 chassis given to Huddersfield Technical College body sold to R. Ganatt. 146 CCX648 Daimler CWA6 11494 Duple UH30/26R 1 1 1944 - ? 150 VH4682 AEC Regal 6621372 Northern Counties B32R 1 10 1932 - 31 7 1938 sold to W. North, Leeds, sold to Reliance, Newbury. 151 VH4702 AEC Regal 6621373 Northern Counties B32R 1 10 1932 - 30 10 1939 Commandered by military 1 7 1940 returned 8 1 1941 in service to ? 12 1943 sold to Maltby Miners Coal & Transport Scheme Ltd.
152 VH4703 AEC Regal 6621374 Northern Counties 32 1 10 1932 - 10 7 1939 sold to W. North, Leeds. 153 VH4759 KARRIER 33047 Northern Counties B32R 5 11 1932 - 31 7 1938 sold to W. North, Leeds. 154 VH4760 KARRIER 33048 Northern Counties B32R 5 11 1932 - 31 7 1938 sold to W. North, Leeds. 154 DCX954 AEC Regent lll 09611326 Park Royal H30/26R 5 12 1947 - ? 186 NCX886 AEC Regent V D2RA441 C.H.Roe H37/28R ? 4 1958 - ? loaned to Bradford C.T. 9 1 1974 passed to W.Y.P.T.E. 1 4 1974 as 4186 after use in Bradford it returned as A13 Training Bus for the W.Y.P.T.E. 190 GNU190 Sentinel STC4-40 Beadle B40F on loan from Sentinel, Shrewsbury. 195 SCX195 AEC Regent V 2D2RA951 East Lancashire H39/31F ? 1960 - 31 5 1973 sold to Hartwood Export passed to Smith, Buntingford. 201 CCX649 Daimler CWA6 11438 Duple UL27/28R 1 10 1943 - 9 10 1952 sold to Gardale Service Garage, Nottingham. 202 CCX650 Daimler CWA6 11602 Duple UL27/28R 1 5 1944 - 17 4 1952 sold to Greenshield Bus Service, Salisburgh, Motherwell. 203 CCX651 Daimler CWA6 11618 Duple UL27/28R 1 5 1944 - 30 9 1954 sold to Birds Commercial Motors. 204 CCX660 Daimler CWA6 11663 Brush UL27/28R 25 3 1944 - 9 10 1952 sold to Gardale Service Garage, Nottingham. 205 CCX661 Daimler CWA6 11664 Brush UL27/28R 25 3 1944 - 3 11 1953 sold to Arther Rowe, Cudworth, Barnsley. 206 CCX662 Daimler CWA6 11665 Brush UL27/28R 13 5 1944 - 26 10 1954 sold to W.T. Bird Stratford on Avon. 207 CCX663 Daimler CWA6 11666 Brush UL27/28R 25 3 1944 - 26 10 1954 sold to W.T.Bird Stratford on Avon. 208 CCX698 Daimler CWA6 11747 Brush UL27/28R 9 8 1944 - 9 6 1952 sold to Superior Coaches, Hadleigh, Essex. 209 CCX699 Daimler CWA6 11748 Brush UL27/28R 1 8 1944 - 9 10 1952 sold to Gardale Service Garage, Nottingham. 211 CCX733 Daimler CWA6 11881 Duple UL27/28R 2 12 1944 - 30 9 1954 sold to W.T.Bird Stratford on Avon. 212 CCX734 Daimler CWA6 11892 Duple UL27/28R 1 1 1945 - 30 9 1954 sold to W.T. Bird Stratford on Avon. 213 CCX735 Daimler CWA6 11883 Duple UL27/28R 2 12 1944 - 17 7 1952 sold to Wesleys Coach Services, Stoke Goldington, Newport Pagnall. 215 CCX737 Daimler CWA6 11893 Duple UL27/28R 1 1 1945 - 30 9 1954 sold to W.T.Bird Stratford on Avon. 216 CCX776 Daimler CWA6 12192 Duple UL27/28R 1 7 1945 - 30 9 1954 sold to W.T.Bird Stratford on Avon. 361 TVH497 a 1961 AEC-HANSON Regent 6676 C.H.Roe H37/28F 1 10 1969 - 29 6 1970 taken over with the services of Hansons Buses (361) 1 10 1969 Originally rebuilt in 1954 from Hansons coach 295 EVH805 9621E1205 a 1950 AEC Regal lll, with Duple FC33F as 326 EVH805 with Duple-Plaxton FC33F sold to Telefilms, Preston. then Thornes, Bubwith then W.Roberts (Marsh). 368 VVH348 a 1962 AEC-HANSON Regent 6679 C.H.Roe H37/28F 1 10 1969 - 30 12 1969 taken over with the services of Hansons Buses (368) 1 10 1969 Originally rebuilt in ? 4 1962 from Hansons bus 285 ECX414 9612E2643 a AEC Regal lll, with C.H.Roe H31/25R sold to R. I. Davis, Tredegar. 370 VVH350 a 1962 AEC-HANSON Regent 6681 C.H.Roe H37/28F 1 10 1969 - 30 11 1969 taken over with the services of Hansons Buses (370) 1 10 1969 Originally rebuilt in 1954 from Hansons coach 294 EVH807 9621E1207 a 1950 AEC Regal lll, with Duple FC33F as 325 EVH807 with Duple-Plaxton FC33F sold to Wilson of Cornwath. 375 XVH133 a 1962 AEC-HANSON Regent 6682 C.H.Roe H37/28F 1 10 1969 - 7 4 1970 taken over with the services of Hansons Buses (375) 1 10 1969 Originally rebuilt in ? 4 1963 from Hansons bus 287 ECX416 9612E2647 a AEC Regal lll, with C.H.Roe H31/25R sold to Knutsford Services (staff bus). 401 VH5723 RANSOMES, SIMS & JEFFERIES 2161 Trolleybus Brush H60R 3 12 1933 - 11 9 1946 previously numbered 1, before ? 4 1942. sold to Harehills Motors after parts removed. 402 VH5724 KARRIER 54048 Trolleybus Park Royal H60R 3 12 1933 - 1 8 1947 previously numbered 2, before ? 4 1942. sold to Harehills Motors after parts removed. 403 VH5725 KARRIER Trolleybus Park Royal H60R 3 12 1933 - 31 7 1947 previously numbered 3, before ? 4 1942. sold to Harehills Motors after parts removed. 404 VH5726 SUNBEAM P12005 Trolleybus Park Royal H60R 4 12 1933 - 31 5 1946 previously numbered 4, before ? 4 1942. sold to L Western after parts removed. 405 VH5727 KARRIER 54046 Trolleybus English Electric H60R 4 12 1933 - 1 8 1947 previously numbered 5, before ? 4 1942. sold to Harehills Motors after parts removed. 406 VH5728 ENGLISH ELECTRIC 663T073 Trolleybus English Electric H60R 4 12 1933 - 31 7 1947 previously numbered 6, before ? 4 1942. sold to Harehills Motors after parts removed. 408 VH6751 KARRIER 54085 Trolleybus Brush H34/30R 8 11 1934 - ? previously numbered 8, before ? 4 1942. sold to Reading Passenger Transport. 409 VH6752 KARRIER 54086 Trolleybus Brush H34/30R 11 11 1934 - ? previously numbered 9, before ? 4 1942. sold to Reading Passenger Transport. 410 VH6753 KARRIER 54087 Trolleybus Brush H34/30R 5 11 1934 - ? previously numbered 10, before ? 4 1942. sold to Reading Passenger Transport. 411 VH6754 KARRIER 54089 Trolleybus Brush H34/30R 12 11 1934 - ? previously numbered 11, before ? 4 1942. sold to Reading Passenger Transport. 411 WVH411 LEYLAND Titan PD3 C.H.Roe H39/31F 1 11 1962 - ? Loaned to Sheffield ? 10 1973 - ? 11 1973 last bus in streamline livery, passed to W.Y.P.T.E. 1 4 1974 as 4411, sold to OK Motor Services, Bishop Aukland. 412 VH6755 KARRIER 54090 Trolleybus Brush H34/30R 12 11 1934 - ? previously numbered 12, before ? 4 1942. sold to Reading Passenger Transport. 413 VH6756 KARRIER 54091 Trolleybus Brush H34/30R 11 11 1934 - ? previously numbered 13 before ? 4 1942. sold to Reading Passenger Transport. 414 VH6757 KARRIER 54092 Trolleybus Brush H34/30R 12 11 1934 - ? previously numbered 14, before ? 4 1942. sold to Reading Passenger Transport. 415 VH6758 KARRIER 54093 Trolleybus Brush H34/30R 11 11 1934 - ? previously numbered 15, before ? 4 1942. sold to Reading Passenger Transport. 416 VH6759 KARRIER 54094 Trolleybus Brush H34/30R 11 11 1934 - ? previously numbered 16, before ? 4 1942. sold to Reading Passenger Transport. 417 VH6760 KARRIER 54095 Trolleybus Brush H34/30R 12 11 1934 - ? previously numbered 17, before ? 4 1942. sold to Reading Passenger Transport. 418 VH6761 KARRIER 54096 Trolleybus Brush H34/30R 11 11 1934 - ? previously numbered 18, before ? 4 1942. 419 VH6765 KARRIER 54097 Trolleybus Park Royal H34/30R 7 11 1934 - 25 7 1948 previously numbered 19, before ? 4 1942. sold to P.M. Morrell, Leeds. 420 VH6767 KARRIER 54098 Trolleybus Park Royal H34/30R 11 11 1934 - 28 7 1948 previously numbered 20, before ? 4 1942. sold to P.M. Morrell, Leeds. 421 VH6766 KARRIER 54099 Trolleybus Park Royal H34/30R 11 11 1934 - 28 7 1948 previously numbered 21, before ? 4 1942. sold to P.M. Morrell, Leeds. 422 VH6768 KARRIER 54100 Trolleybus Park Royal H34/30R 11 11 1934 - 28 7 1948 previously numbered 22, before ? 4 1942. sold to P.M. Morrell, Leeds. 423 VH6771 KARRIER 54106 Trolleybus Park Royal H34/30R 11 11 1934 - 28 7 1948 previously numbered 23, before ? 4 1942. sold to P.M. Morrell, Leeds. 424 VH6772 KARRIER 54107 Trolleybus Park Royal H34/30R 12 11 1934 - ? 8 1948 previously numbered 24, before ? 4 1942. sold to L.B. Kell, Close Hill, Newsome. 425 VH6769 KARRIER 54101 Trolleybus Park Royal H34/30R 11 11 1934 - 28 7 1948 previously numbered 25, before ? 4 1942. sold to P.M. Morrell, Leeds. 428 VH6773 KARRIER 54108 Trolleybus Park Royal H34/30R 11 11 1934 - 31 12 1948 previously numbered 28, before ? 4 1942. destroyed by fire 6 1 1940, rebodied 1 5 1941, sold to P.M. Morrell, Leeds. 431 VH8722 KARRIER 54124 Trolleybus Metro Cammel Weymann H34/30R 5 3 1936 - ? 2 1948 previously numbered 31, before ? 4 1942. sold to P.M. Morrell, Leeds. 432 VH8530 KARRIER 54123 Trolleybus Park Royal H34/30R 21 12 1936 - 31 1 1949 previously numbered 32, before ? 4 1942. sold to P.M. Morrell, Leeds. 433 VH9933 KARRIER 31003 Trolleybus Park Royal H34/30R 1 5 1937 - 31 1 1949 previously numbered 33, before ? 4 1942. sold to P.M. Morrell, Leeds. 434 VH9934 KARRIER 31004 Trolleybus Park Royal H34/30R 3 5 1937 - ? 1 1949 previously numbered 34, before ? 4 1942. sold to P.M. Morrell, Leeds. 435 VH9935 KARRIER 31005 Trolleybus Park Royal H34/30R 2 5 1937 - ? 1 1949 previously numbered 35, before ? 4 1942. sold to P.M. Morrell, Leeds. 436 VH9936 KARRIER 31006 Trolleybus Park Royal H34/30R 1 5 1937 - ? 1 1949 previously numbered 36, before ? 4 1942. sold to P.M. Morrell, Leeds. 437 VH9937 KARRIER 31007 Trolleybus Park Royal H34/30R 2 5 1937 - ? 1 1949 previously numbered 37, before ? 4 1942. sold to P.M. Morrell, Leeds. 438 VH9938 KARRIER 31008 Trolleybus Park Royal H34/30R 4 5 1937 - ? 2 1948 previously numbered 38, before ? 4 1942. 439 VH9939 KARRIER 31009 Trolleybus Park Royal H34/30R 2 5 1937 - 28 2 1949 previously numbered 39, before ? 4 1942. sold to P.M. Morrell, Leeds. 440 VH9940 KARRIER 31010 Trolleybus Park Royal H34/30R 2 5 1937 - 31 1 1949 previously numbered 40, before ? 4 1942. sold to P.M. Morrell, Leeds. 441 AVH441 KARRIER 31019 Trolleybus Park Royal H34/30R 3 10 1937 - 31 1 1949 previously numbered 41, before ? 4 1942. sold to P.M. Morrell, Leeds. 442 AVH442 KARRIER 31020 Trolleybus Park Royal H34/30R 1 10 1937 - 28 2 1949 previously numbered 42, before ? 4 1942. sold to P.M. Morrell, Leeds. 443 AVH443 KARRIER 31021 Trolleybus Park Royal H34/30R 1 10 1937 - 28 2 1949 previously numbered 43, before ? 4 1942. sold to P.M. Morrell, Leeds. 444 AVH444 KARRIER 31022 Trolleybus Park Royal H34/30R 6 10 1937 - 23 1 1952 previously numbered 44, before ? 4 1942. sold to P.M. Morrell, Leeds. 445 AVH445 KARRIER 31023 Trolleybus Park Royal H34/30R 4 10 1937 - 28 2 1949 previously numbered 45, before ? 4 1942. sold to P.M. Morrell, Leeds. 446 AVH446 KARRIER 31024 Trolleybus Park Royal H34/30R 4 10 1937 - ? 7 1952 previously numbered 46, before ? 4 1942. sold to R. Jannett, Leeds. 447 AVH447 KARRIER 31025 Trolleybus Park Royal H34/30R 2 10 1937 - ? 4 1951 previously numbered 47, before ? 4 1942. body shell sold to P.M. Morrell, Leeds. 448 AVH448 KARRIER 31026 Trolleybus Park Royal H34/30R 3 10 1937 - 24 4 1951 previously numbered 48, before ? 4 1942. sold to P.M. Morrell, Leeds. 449 AVH449 KARRIER 31027 Trolleybus Park Royal H34/30R 3 10 1937 - ? 7 1952 previously numbered 49, before ? 4 1942. sold to R. Jannett, Leeds. 450 AVH450 KARRIER 31028 Trolleybus Park Royal H34/30R 5 10 1937 - 24 4 1951 previously numbered 50, before ? 4 1942. sold to P.M. Morrell, Leeds. 451 AVH451 KARRIER 31029 Trolleybus Park Royal H34/30R 3 10 1937 - 13 3 1951 previously numbered 51, before ? 4 1942. sold to P.M. Morrell, Leeds. 452 AVH452 KARRIER 31030 Trolleybus Park Royal H34/30R 4 10 1937 - 27 11 1953 previously numbered 52, before ? 4 1942. sold to Epsom & Ewell Council, converted into a mobile toilet for Epsom racecourse. 453 AVH453 KARRIER 31031 Trolleybus Park Royal H34/30R 9 11 1937 - 24 4 1951 previously numbered 53, before ? 4 1942. sold to P.M. Morrell, Leeds. 454 AVH454 KARRIER 31032 Trolleybus Park Royal H34/30R 8 11 1937 - 10 8 1951 previously numbered 54 ? 4 1942. sold to P.M. Morrell, Leeds. 455 AVH455 KARRIER 31033 Trolleybus Park Royal H34/30R 8 11 1937 - 2 10 1951 previously numbered 55 ? 4 1942. sold to P.M. Morrell, Leeds. 456 AVH456 KARRIER 31034 Trolleybus Park Royal H34/30R 8 11 1937 - 26 7 1951 previously numbered 56 ? 4 1942. sold to P.M. Morrell, Leeds. 457 AVH457 KARRIER 31035 Trolleybus Park Royal H34/30R 8 11 1937 - ? 7 1952 previously numbered 57 ? 4 1942. sold to R. Jannett, Leeds. 458 AVH456 KARRIER 31034 Trolleybus Park Royal H34/30R 8 11 1937 - 30 4 1950 previously numbered 58 ? 4 1942. sold to P.M. Morrell, Leeds. 459 AVH459 KARRIER 31037 Trolleybus Park Royal H34/30R 9 11 1937 - 28 11 1953 previously numbered 59 ? 4 1942. sold to Epsom & Ewell Council, converted into a mobile toilet for Epsom racecourse. 461 AVH461 KARRIER 31039 Trolleybus Park Royal H34/30R 10 4 1938 - ? previously numbered 61 ? 4 1942. sold to P.M. Morrell, Leeds. 462 AVH462 KARRIER 31040 Trolleybus Park Royal H34/30R 4 1 1938 - 21 7 1954 previously numbered 62 ? 4 1942. sold to F Kilburn Huddersfield. 463 AVH463 KARRIER 31041 Trolleybus Park Royal H34/30R 20 4 1938 - ? 7 1952 previously numbered 63 ? 4 1942. sold to R Jannett, Leeds. 464 AVH464 KARRIER 31072 Trolleybus Park Royal H34/30R 19 6 1938 - 5 3 1954 previously numbered 64 ? 4 1942. sold to F Kilburn Huddersfield. 466 AVH466 KARRIER 31044 Trolleybus Park Royal H34/30R 10 4 1938 - ? 7 1952 previously numbered 66 ? 4 1942. sold to R Jannett, Leeds. 468 AVH468 KARRIER 31046 Trolleybus Park Royal H34/30R 11 4 1938 - ? 7 1952 previously numbered 68 ? 4 1942. sold to R Jannett, Leeds. 469 AVH469 KARRIER 31047 Trolleybus Park Royal H34/30R ? 4 1938 - ? 7 1952 previously numbered 69 ? 4 1942. sold to R Jannett, Leeds. 471 AVH471 KARRIER 31049 Trolleybus Park Royal H34/30R 10 4 1938 - 30 10 1953 previously numbered 71 ? 4 1942. sold to Epsom & Ewell Council, converted into a mobile toilet for Epsom racecourse. 472 AVH472 KARRIER 31073 Trolleybus Park Royal H34/30R 20 6 1938 - ? 7 1952 previously numbered 72 ? 4 1942. sold to R Jannett, Leeds. 480 AVH480 KARRIER 31077 Trolleybus Park Royal H34/30R 19 6 1938 - 1 4 1950 previously numbered 80 ? 4 1942. sold to P.M. Morrell, Leeds. 482 AVH482 KARRIER 31060 Trolleybus Park Royal H34/30R 11 4 1938 - 23 3 1956 previously numbered 482 ? 4 1942. 485 KVH485E DAIMLER Fleetline CRG6 C.H.Roe H43/32F ? 6 1967 - ? fitted with door to close off upper saloon, converted to one man bus passed to W.Y.P.T.E. 1 4 1974 as 4485, sold to Smiths of Sacriston. 486 AVH486 KARRIER 31080 Trolleybus Park Royal H34/30R 20 6 1938 - 29 7 1955 previously numbered 86 ? 4 1942. sold to Aluminium & Allied Products. 488 AVH488 KARRIER 31066 Trolleybus Park Royal H34/30R 10 4 1938 - 30 10 1953 previously numbered 88 ? 4 1942. sold to Epsom & Ewell Council, converted into a mobile toilet for Epsom racecourse. 489 AVH489 KARRIER 31067 Trolleybus Park Royal H34/30R 10 4 1938 - 30 10 1953 previously numbered 89 ? 4 1942. sold to Epsom & Ewell Council, converted into a mobile toilet for Epsom racecourse. 502 7502UA DAIMLER CVG6-30 C H Roe H40/30R on loan from Transport Vehicles Daimler from Leeds City Transport. 506 AVH506 KARRIER 31042 Trolleybus Brush H34/30R 2 1 1939 - 28 2 1949 previously numbered 106 ? 4 1942. sold to P.M. Morrell, Leeds. 507 AVH507 KARRIER 31063 Trolleybus Brush H34/30R 12 5 1938 - 31 1 1949 previously numbered 107 ? 4 1942. sold to P.M. Morrell, Leeds. 510 AVH510 KARRIER 31062 Trolleybus Brush H34/30R 3 5 1938 - 23 4 1951 previously numbered 110 ? 4 1942. sold to P.M. Morrell, Leeds. 511 AVH511 KARRIER 31065 Trolleybus Brush H34/30R 7 5 1938 - 31 1 1949 previously numbered 111 ? 4 1942. sold to P.M. Morrell, Leeds. 512 AVH512 KARRIER 31064 Trolleybus Brush H34/30R 15 4 1938 - 28 2 1949 previously numbered 112 ? 4 1942. sold to P.M. Morrell, Leeds. 513 AVH513 KARRIER 31053 Trolleybus Brush H34/30R 30 4 1938 - 28 2 1949 previously numbered 113 ? 4 1942. sold to P.M. Morrell, Leeds. 514 AVH514 KARRIER 31058 Trolleybus Brush H34/30R 26 4 1938 - 28 2 1949 previously numbered 114 ? 4 1942. sold to P.M. Morrell, Leeds. 515 AVH515 KARRIER 31050 Trolleybus Brush H34/30R 2 1 1939 - 19 4 1947 previously numbered 115 ? 4 1942. 516 AVH516 KARRIER 31094 Trolleybus Weymann H34/30R 1 1 1940 - 25 7 1955 previously numbered 116 ? 4 1942. sold to Aluminium & Allied Products. 520 AVH520 KARRIER 31098 Trolleybus Weymann H34/30R 1 1 1940 - 25 7 1955 previously numbered 120 ? 4 1942. sold to Aluminium & Allied Products. 521 AVH521 KARRIER 31099 Trolleybus Weymann H34/30R 1 1 1940 - 28 6 1955 previously numbered 121 ? 4 1942. sold to Aluminium & Allied Products. 522 AVH522 KARRIER 31100 Trolleybus Weymann H34/30R 1 1 1940 - 20 6 1955 previously numbered 122 ? 4 1942. sold to Aluminium & Allied Products. 7552 7552MX AEC Renown Demonstrator passed to Burwell & District, Cambridge.